Filed under: Anne et Valentin, HEALTH! Wednesday with Dr. Brad Newton!!! It’s that time of week again and Dr. Newton never ceases to amaze us. Although his shirt is more subdued than usual, the patterns are far from average. We love how his Anne et Valentin frames match perfectly! 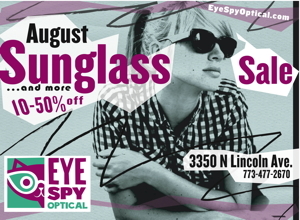 Don’t forget that the August Sunglass Sale is in effect! For the entire month of August our sunglasses are on sale from 10%-50% off! We also have select eyeglasses on sale…come on in and get that frame you’ve been dreaming of!!! NEW YEAR, NEW CUSTOMERS OF THE WEEK!